"What a fantastic book!... It was fun to build the viewer and design it with the fantastic stickers provided... There's something for everyone to learn from it and just can't say enough how nice the book is... would be a fantastic Christmas present!" "I really enjoyed making the headset and using my parents phone to use the app that comes with it. I learnt so much and my little brother also enjoyed reading this book with me"
"Well written, intriguing and captivating book about the virtual reality explained for the younger generation in a way that they understand... definitely a worthy book to own!" "A really education and fun book suitable for all the family"
"My son LOVES anything to do with computers and technology, so this book was right up his street!... Great fun and a brilliant way to explain how technology works and gets some hands on experience of putting that knowledge into practice"
"Both of my kids have read this and think that it is a great book... It is full of interesting facts and it is written in a way that keeps the children reading, the headset and app bring it alive!... 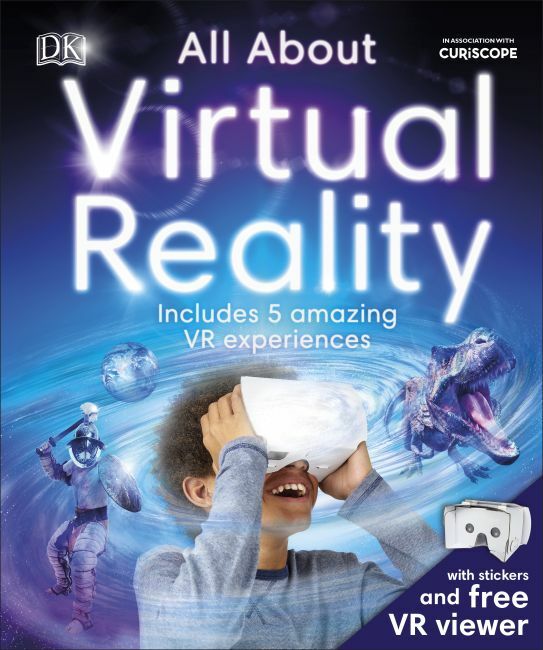 we would definitely get more books like this"
A groundbreaking children's book that explains everything you need to know about virtual reality including how we see in 3D, how a VR world is created, how VR works on a smartphone, how VR can feel real and even who uses VR. Includes a make-it-yourself VR viewer that can be used with a smartphone to experience the wonders of VR. Plus stickers to decorate your VR viewer! Want to see the world without leaving your seat? Fancy exploring the Roman Colosseum or hopping aboard the International Space Station? Virtual reality is here - are you ready for it? With DK and Curiscope's All About Virtual Reality, you will be. Learn everything you've ever wanted to know about VR, from aircraft simulators to the more recent developments such as Oculus Rift and Curiscope's Virtuali-Tee, an augmented reality t-shirt. Using the make-it-yourself VR viewer you can start experiencing virtual reality straight away with Curiscope's DK Virtual Reality app available on Apple and Android systems. Use your VR viewer to explore 5 scopes and come face-to-face with a T.Rex, explore the inside of a volcano, go back in time to the Colosseum in Ancient Rome, visit the International Space Station and jump into a pond.